A new report from real estate search engine Zillow found that 7.7 percent of Cambridge households earning $350,000 or more annually are headed by someone at least 55 years old. That means that the People's Republic has the second-highest concentration of affluent baby boomers in the U.S., behind only the Washington, D.C., suburb of Arlington, Va.
Not surprisingly, perhaps, Cambridge has a comparatively small share of wealthier households headed by the baby boomers' children and grandchildren. 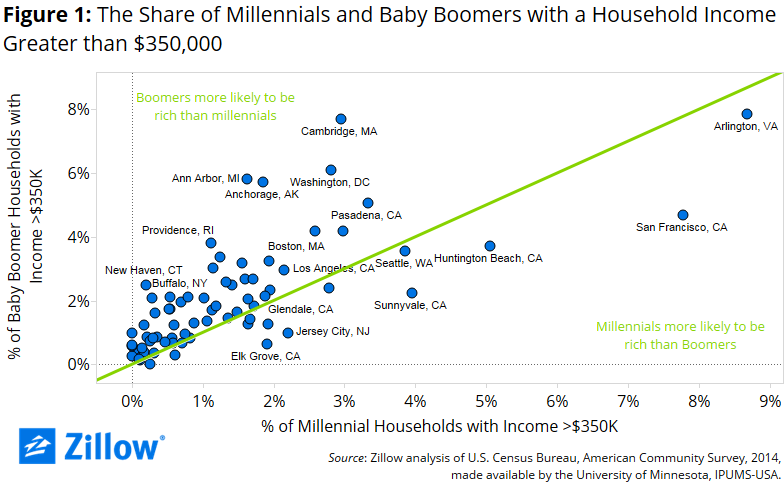 In the city, 2.5 percent of Cambridge households earning $350K are headed by millennials. Per Zillow: "This is likely attributable to the large number of young students and recent graduates living in Cambridge, still working to fully capitalize on their valuable degrees from prestigious Cambridge universities including Harvard and M.I.T. " As for those well-off boomer households, their larger-than-normal presence in Cambridge can be considered a good thing, at least for the real estate industry. "[W]ell-off empty-nesters are proving to be a big pool of buyers for luxury condo developments popping up in Boston and Cambridge,"according to the Globe's Tim Logan. As for Boston proper, 3.2 percent of its households pulling down at least $350K are headed by a boomer.